Do you know what I like? I like a good burger located near my home. Enter the recently opened Culver City, Ca location of Smashburger. 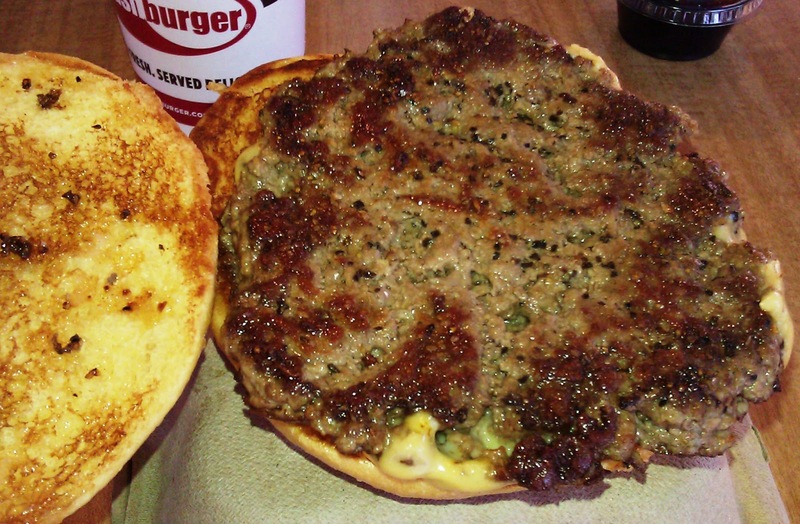 This is excerpted from the Smashburger website: "...Why meatballs, not patties? Because unlike the other burger places, we don’t squish. We smash. Place your order and we spring into action, painting the grill with real butter, adding a dash of our secret spice blend, and smashing the meatball with a tool we invented ourselves (it’s so new, it doesn’t even have a name — let’s just call it the smashing tool). Smashing caramelizes the beef, creating a sear that locks in the juices as no other cooking method can. The result is a burger that’s more tender and flavorful than anybody else’s..." Ok, we all know that it's not really caramelization but rather the Malliard Reaction, but that's fine...they were pretty close. Happy Meal were actually on our way to Yogurtland when we discovered that a Smashburger had opened under our noses. They had only been opened for a day or so, and not all of the metal serving trays had arrived yet. On a subsequent visit, the usual stuff was present. We found free parking in the large lot in the strip mall where the newly minted restaurant was located. We ordered our burgers, fries, and drinks, and we settled in for a 15-minute wait. The Beef: Smashburger's beef was 100% certified, Angus Chuck, which had never been frozen. The flavor was solidly beefy and buttery. There was a pleasant note of funk and a bit of iron. The texture was loose. The beef was juicy, and little on the oily side...cooking a burger in butter will do that. The burger patty was about 4 ounces. All told, the burger meat at Smashburger was darn good and very satisfying. The Seasoning: The burger patties were properly seasoned with salt, pepper, and other spices. The seasoning perfectly enhanced the strong beefy flavor of the Med-Well Chuck. The Sear: On our initial visit, the sear was average, but on subsequent visits, the sear was nearly glassy. A Smashburger with a good sear is terrific...a Smashburger with a weak sear is still pretty good. The Preparation: See above. The burgers came out a perfectly juicy Med-Well. They were cooked on a 425 degree, gas-fired flat top. The cooking method, like the burgers at Super Duper Burger in San Francisco, resulted in tender, juicy, and flavorful cheeseburgers. The Cheese: There were a number of cheese choices, and I went with American...good choice. The American cheese provided that perfect amount of iron, salt, and creaminess to round out the bite. 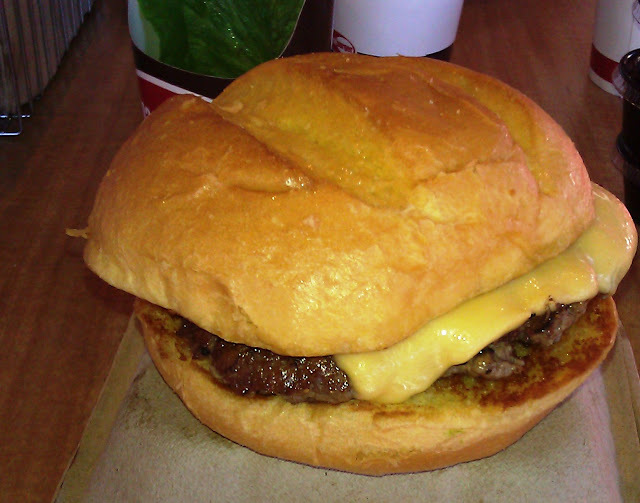 The Bun: There were also a number of bun choices at Smashburger. I went with the classic egg bun. This was a fresh, yeasty, moist, sweet, and nicely chewy bun. The bun was properly toasted, and the edge bites had a nice crispness to them. The Toppings: Smashburger offers a the opportunity to customize one's burger with 8 sauces, 9 veg choices, 7 cheese choices, and 4 bun choices. Those choices varied from location to location. The Romaine lettuce was fresh and crisp. The tomato slices were ripe and juicy. The Spicy Chipotle Mayo was just that, and it was a nice addition to the burger. 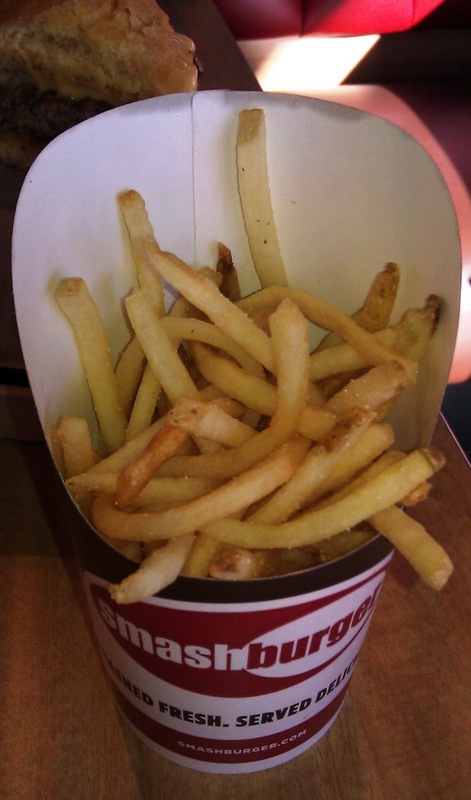 The Fries: The fries at Smashburger were hand-cut and peel-on. The seasoning was the right combination of coarse sea salt. The fries were perfectly crisped and golden brown. Win! The Value: Cheeseburger $5.99--Fries 1.99--Beverage $1.89. That was about 11 bucks with tax for a meal. The value was fine considering the quality of the preparation and the tasty ingredients. I was pleased to finally have a Smashburger in my area. MIRU 8691 was gone, and Wolfgang's Steakhouse only served a burger at lunch. Happy Meal was equally pleased since he was partial to the shakes. Everything at Smashburger was good...not amazing....but really good. Burger Review : Smashburger provided a nearby "really good" cheeseburger at a reasonable price.